Sunday July 24th 1881 I went to church in the forenoon and Rob was there to come down with me. After we got dinner over Mother and Lee came and Rob and I went home. I did not feel well in the afternoon and laid down most of the time I was home. I walked back to town after supper. Monday July 25th 1881 We fixed a chair with padded back and cushion in the forenoon and went to Wins to practice in the afternoon. Was busy working in the evening. 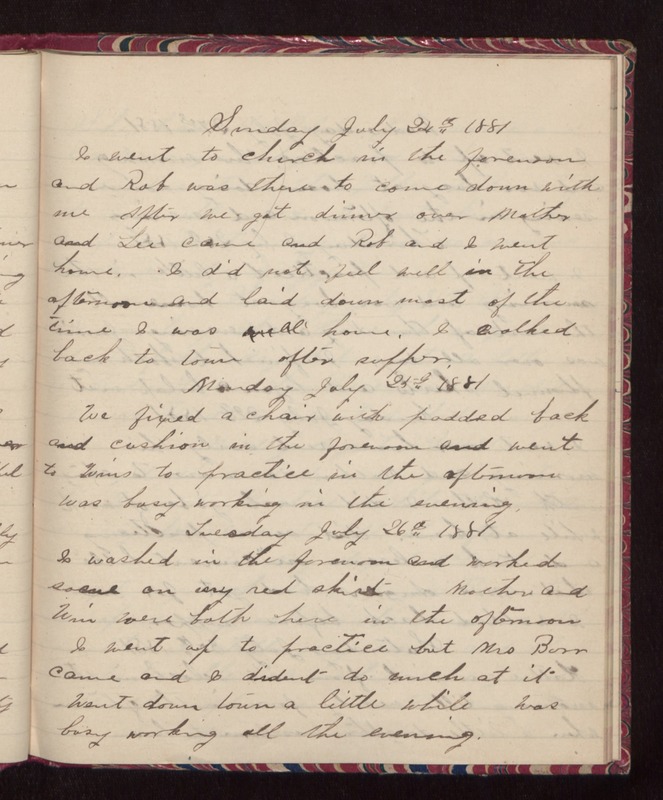 Tuesday July 26th 1881 I washed in the forenoon and worked some on my red skirt. Mother and Win were both here in the afternoon. I went up to practice but Mrs Burr came and I dident do much at it. Went down town a little while. Was busy working all the evening.